More than 200 social housing tenants in Crawley are getting around £120 off their annual electricity thanks to a project between Crawley Borough Council and Your Energy Sussex. The solar panels installed on homes owned and maintained by Crawley Homes provide tenants, many of whom are juggling tight household budgets, with free, clean electricity to use during the day. Your Energy Sussex uses the income received through feed-in-tariffs to pay back the cost of installing the systems. 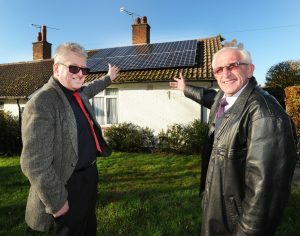 Crawley Borough Council continues to work with residents to help them get the most from their solar panels and use as much free electricity as they can. Residents have been encouraged to change their daily routines by, for example, using household appliances and charging devices such as tablets and mobile phones during the day when the sun is shining.